A couple in Cincinnati acquired a peculiar phonograph at an antique auction. 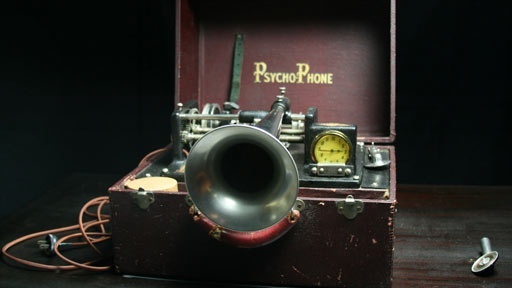 The machine was labeled “PsychoPhone” and included four, grooved wax cylinders. Their research makes our contributors think Thomas Edison invented the PsychoPhone to record messages from the afterlife. Did Edison make a machine to unlock the secrets of the dead? The wax cylinders could hold the answer. History Detectives travels to the Thomas Edison Center at Menlo Park in New Jersey to find out. Also with Gwen Wright Railroad Station Is a disused depot the first railroad station in Texas? Also with Gwen Wright Boxcar Home Why is a boxcar buried beneath this suburban kitchen? Also in Season 7 Booth Letter Did the father of John Wilkes Booth threaten to assassinate the President? Also in Emerging Modern America: 1890-1930 Teddy Roosevelt War Club What could this strange object have to do with Teddy Roosevelt and his run for a third term presidency? Also in Season 7 Fillmore Pardon Did President Fillmore pardon a Native American convicted of murder?